By buying this product you can collect up to 160 Yachtaid Points. Your cart will total 160 points that will be converted into a voucher towards your next purchase! Must be logged in to collect points. High class in your glass! The Isotherm Clear Ice Maker uses the spray technology to offer you fresh, clear ice. 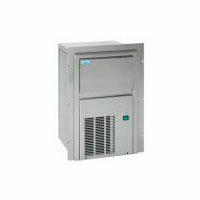 The Isotherm Clear Ice Maker is a compact, spray‐type, ice maker that will produce up to 40 pounds of crystal‐clear ice per day. The Isotherm Clear Ice Maker is designed to work in a boating environment where other clear ice makers will not. The ice produced is a barrel‐shaped, crystal‐clear, ‘top hat’ ice that is very dense and slow‐melting. Clear ice does not have air trapped in it like conventional white, crescent‐shaped ice. Conventional ‘white ice’ releases freezer air in drinks as it melts and changes the flavor of drinks. The Isotherm Clear Ice does not change the flavor of drinks, so whether you’re drinking water, sodas, or cocktails, you’ll get the pure flavor of the drink. The spray-type clear ice maker stores ice in an insulated bin, not a freezer, so the ice is always a loose ice. The Clear Ice Maker requires a drain. This ice maker is the fastest one I have seen so far, works great.